Near the Lisbon and sited in a Nature Reserve, Tróia Design hotel is a contemporary five-star resort with the fabulous Atlantic Ocean, beaches, Sado River and the stunning Arrábida Mountain views. Experience the unique and cosy environment, where the design is presenting in every detail. 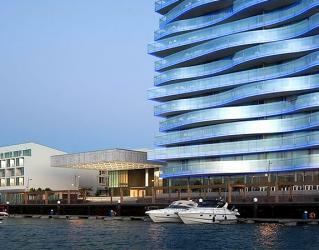 Tróia Design Hotel leads the way in the joy of living, including a Casino, Show Center as well as a Conference Center. The spa located in 1200 square metres and offers over 70 different relaxation treatments. The luxurious rooms are spacious and have modern designs. There is also a bar and restaurants serving refreshing drinks, light snacks and world variety tastes. 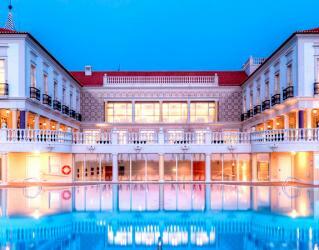 As a member of “Leading Hotels of the World”, Hotel Quinta Do Lago is an outstanding prestigious hotel. Its 5* luxury offerings and close distance to the various golf courses in Quinta Do Lago make it one of the top preferences of golfers. The hotel is located overlooking a tidal lagoon in Rio Formosa Natural Park, which is one of Portugal’s stunning the Atlantic Ocean. All over the hotel, you will enjoy a magnificent panoramic view over the Ria Formosa’s tidal lagoon and the Atlantic Ocean. 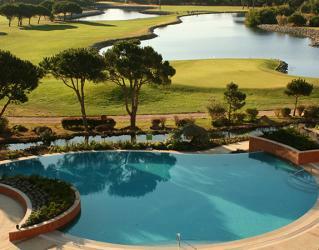 The free shuttle service to the golf courses in Quinta do Lago will be extra delightful for the golfers. Located among the rolling hills, lush gardens and serene mountain lakes, Penha Longa Resort, one of the most stunning luxury resorts in Portugal. They offer a rare opportunity for visitors to explore the breathtaking beauty of Sintra Mountains and enjoy elegant accommodations, world-class restaurants, Golf Championship, luxurious spa and wellness centre. Located over the sea and close to the Cascais Marina, this hotel is an ideal t place to spend your holidays, to hold business meetings or special events. Set in a region offering a variety of experiences, highlighting the golf, surf and historical and a cultural beauty important site (Paula Rego Stories House, Marechal Carmona Park, Cultural Centre of Cascais). It has 233 spacious bedrooms, a restaurant with a show cooking station, two bars, meeting rooms with natural lighting and a health club featuring a sauna and massage cabinets. Aroeira Golf Resort Hotel located in a preserved area. It is the largest housing and golf complex in the Greater Lisbon area and 25km from the centre of Lisbon, just 600 meters from the beach. Sheraton Cascais Resort has an excellent location on Portugal’s sweeping Atlantic coast just 30 minutes from Lisbon and about a mile from the famous Guincho Beach, one of the best surfing spots in Europe. 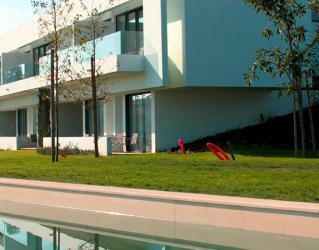 The Resort has located near the best golf courses in Portugal. The hotel's 156 accommodations from Deluxe Rooms to 3 Bedroom Suites that transform guests experience. A Glass Terrace Restaurant with access to the garden provides a welcoming atmosphere. Luxurious Serenity Spa offers a wide range of wellness and reinvigorating treatments to recharge both body and soul. Tranquility and serenity is the key to the resort. Praia D'El Rey Marriott Golf & Beach Resort offers 177 rooms with private terraces or balconies offers stunning views of either the Atlantic Ocean or the beautiful 18 holes championship golf course and gardens. Tempera is an all-day restaurant offering daily thematic buffets. A state of the art fitness centre is available for your workout. MH Peniche provides a calm and welcoming environment, fitting into a sea and beach settings. The hotel's atmosphere allows every guest to get close to nature. Several room types option offering to guest suitable for the different needs. Sophisticated atmosphere of the restaurants takes you to the history and joy of traditional tastes. 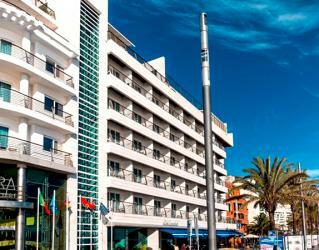 SANA Sesimbra Hotel located in the centre of the fishing village of Sesimbra. 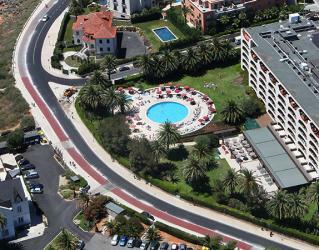 The hotel located just next to the beach and 40 minutes away from Lisbon. The central location of Sesimbra, a short distance from the business areas of Setúbal and region, makes SANA Sesimbra Hotel an ideal choice for a vacation. 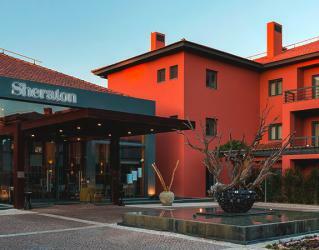 The hotel surrounds by the tranquil Serra da Arrábida Natural Park and beaches. And there are several golf courses around: Quinta Peru Golf Course – Azeitão (17 km), Clube de Golf Aroeira (26 km), Campo de Golf do Montado (40 km), Ribagolf I and II (64 km),Tróia Golf (40 km - Ferry). 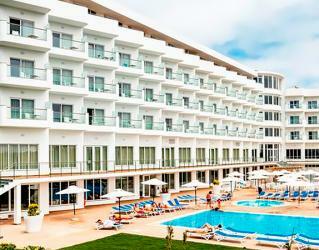 The Bom Sucesso Resort (BOS) is located on the banks of Óbidos Lagoon, by the Atlantic Ocean, 80km from Lisbon. 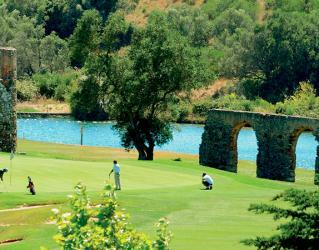 The area is an excellent destination for practising golf and water sports. Its unique location enjoys a mild climate. An excellent gastronomic offer in a place served for relaxation. 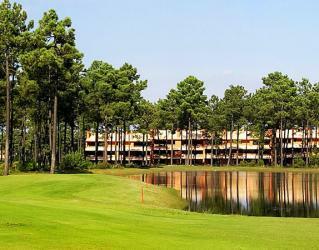 The hotel also features 18-hole Championship golf course and modern room designs.